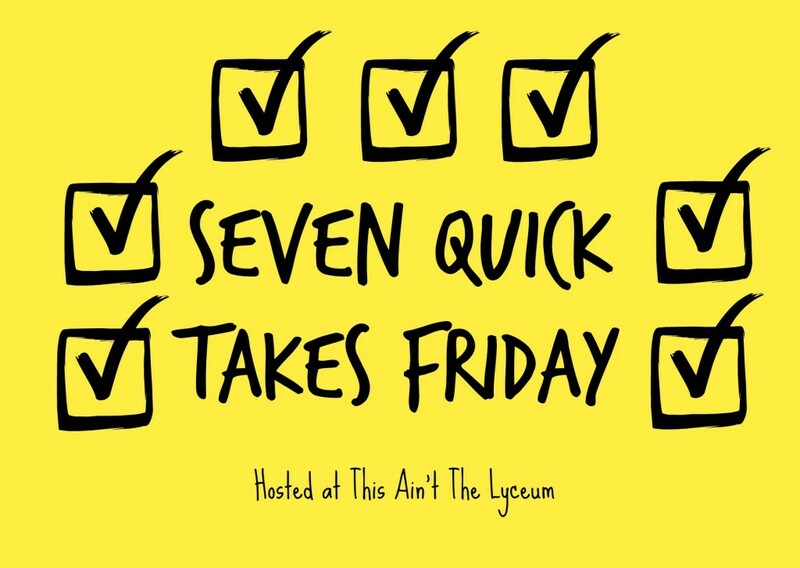 Please join me and other Catholic bloggers at This Ain’t the Lyceum for Seven Quick Takes Friday. I’m using this opportunity to catch up on a bunch of reviews. Opal’s Jubilee by Leslie Lynch Opal McBride has paid her debt to society, but it’s only when detective Josh Boone untangles the secrets of her past that justice can be truly served. Beautifully written, this is my favorite book of the series. Lynch is not an author to shy away from difficult issues. In this one, the topic of domestic violence is tackled. Highly recommend! Hush, Hush by Michelle Quigley I enjoyed the author’s debut novel, set in Northern Ireland at the beginning of WW II. Molly is normal sixteen-year-old. One night, she is brutally assaulted. What follows is a heart-wrenching journey through anger and denial as the young girl suffers in secret and silence. Molly initially tells her family only that she is pregnant but not about the assault. Sensitively told, this is a compelling story that illustrates the preciousness of every human being as an unrepeatable gift (with a nice plot twist at the end). Georgios by A.K. Frailey Interesting, factual, well-researched, A.K. Frailey’s Georgios is a must read for historical fiction fans. The novel takes place in the year 100 AD and our young protagonist has been “destined for greatness” by his family. The Greek boy later discovers that his lineage isn’t what he thought it was. In the end, this unique coming of age story is an inspiring tale for young and old. The Grace of Yes by Lisa Hendey The Grace of Yes is a moving, inspiring, challenging and entertaining look at the virtues. I was especially touched by the personal experiences Hendey shares. The book is beautifully written in conversational tone and is one that can be read and reread over and over. While I loved the author’s other books, this one has become my favorite. Highly recommend. Watershed by Neil Hamilton Today and tomorrow this book is still FREE on Kindle. Watershed is a compelling international mystery novel set against the backdrop of the “looming water shortage in the American Southwest.” Hamilton, who is a retired member of the RCAF, uses his military background to create a realistic political mystery that takes place mostly in the USA and Canada. For me, as a resident of the Ottawa Valley, I particularly enjoyed the scenes describing downtown Ottawa and the surrounding area.The writing is solid. There are many characters to keep track of, but the development and dialogue are well done, especially with the main characters. There are, however, numerous swear words and mature situations, so the book would not be appropriate for children and those sensitive to language. 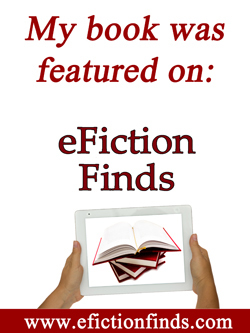 Eve’s Apple by Marie Therese Kceif Like many other teens, Marie was rebellious. That rebellion continued into young adulthood and a career in aviation. Abuse, bankruptcy and divorce led her back to God. Eve’s Apple is a witness to how “God gently guides one of His Eves into a slow freeing surrender of a Mary’s trusting yes.” Compelling true story. I’m over at the Catholic Writers Guild Blog today talking about finding inspiration in the little things. Special thanks to Carolyn Astfalk for the wonderful interview over at her blog! Enjoy this entertaining video made by my second oldest son (and starring the three youngest sons). It was shot back in 2007 when at least two of my boys were shorter than me! 5. Anniversary – 33 Years! It’s hard to believe it’s been 33 years! We’ll be celebrating by going to Mass and then out to breakfast. 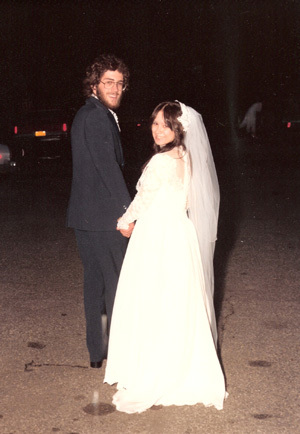 If you click on the link below, I uploaded a short slide show with photos and audio from our wedding 33 years ago. I thank God every day for our life together. To briefly review how NFP works: husband and wife chart the wife’s signs of fertility and infertility. (Note: the man is fertile every day of his post-pubescent life, assuming there are no health difficulties). The couple then determines the start and end of the fertile time (we call it Phase II). If they are avoiding pregnancy, they abstain during the fertile time. If they are planning a pregnancy, they engage in relations during this time. Although it sounds simplistic, there are various scenarios, conditions and more complicated issues that arise, so formal NFP classes (either live or online) are recommended. One of the keys to each couple’s success in using NFP is effective communication. NFP works best when the couple together study and observe the woman’s signs of fertility and infertility. Ideally, each month, the NFP couple discusses whether they will be avoiding a pregnancy or achieving a pregnancy. Because NFP can be used both to plan and to avoid pregnancy, it’s a good idea to have this conversation every month, even if the couple has decided that they will be avoiding pregnancy for a year or more. When internal shifts in emotional attitude are brought to the surface, the couple can unite in their efforts to carry out their plans regarding abstinence. In over 30 years of using NFP, often one of us was more open to pregnancy than the other. Sometimes our monthly conversations were long and complicated; other times, short. The important point is that these types of dialogues are meant to take place well before — and not in the middle of — the marital embrace. When the NFP couple is discussing intimate topics such as mucus and other fertility signs, it enhances their marital and sexual life, thereby increasing intimacy. 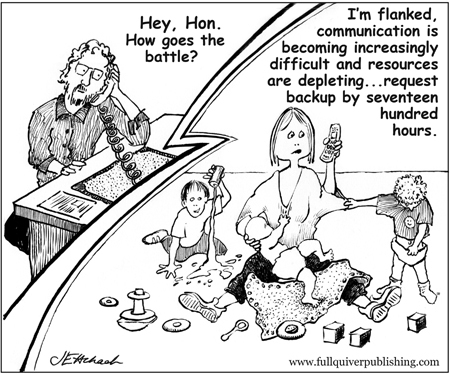 This sort of communication should also continue when the couple is postpartum (after having a baby) and in post-menopause (after menopause). When they are avoiding pregnancy, abstinence can be difficult and challenging. Being able to freely talk to your spouse helps you to understand that you are not alone in the struggles and challenges of NFP. This can help to bring a couple closer together and can promote marital stability. NFP demands the kind of intimate and deep conversations that allow the couple to grow closer. Natural Family Planning has many benefits. One of its most significant benefits is that it promotes deep, honest and frequent marital communication. Photo by Tim Baklinski of Two Trees Photography. All rights reserved. Special thanks to Carolyn Astfalk for this wonderful interview. She asked some great questions! I’ve had the pleasure of knowing Ellen first through her novels, then the Catholic Writers Guild, and, now, as my editor and publisher. Since my husband and I will be celebrating our anniversary next week, I’d like to share seven of my favorite quotes on marriage. 3. “Be not afraid.” (Saint John Paul II) As shown in the photo below, I certainly wasn’t afraid of what the future would hold for us. I was too happy at that moment to think of future difficulties and challenges. I had no idea what the next 33 years would bring. All married couples will face hardships and challenges. But they will also experience great joy to balance any hardships. 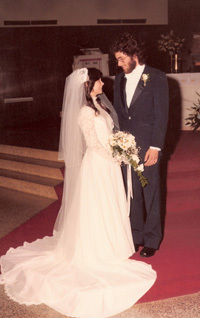 Of course, couples who enter into a sacramental marriage (and who live their faith) have the additional graces to assist them in handling any challenges and hardships. In honor of Mother’s Day, I’d like to re-post this tribute to my mom. 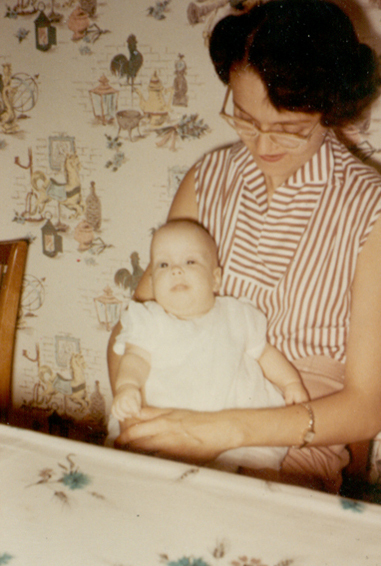 Like most of us, Mom wasn’t perfect, but in many respects, she was a great example. When she became pregnant at age 47, her doctor insisted that she have an abortion. She refused and several months later, gave birth to my youngest sister. I am grateful for the many years I had with Mom, but I miss her very much. Wife, mother, sister, grandmother, mother-in-law, stepmother, sister-in-law, aunt, cousin, friend. She was Betti (with an i). She was witty, loving, generous, giving, unselfish. 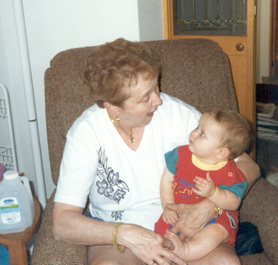 She enjoyed her grandchildren (at right, with my son, Adam, 1996), transcribing (and was the fastest typist I know). She loved surprising people, visiting Canada, talking on the phone, doing crossword puzzles, reading. Her favorite music was West Side Story, Jesus Christ Superstar, Abba and Fleetwood Mac. Upon meeting Mom, most people immediately felt comfortable with her and she would often strike up conversations with people she didn’t know. She cherished having a new baby when she was 47 and all that came with it: being a lunch mother, taking Laurie to dance lessons and Catholic school. 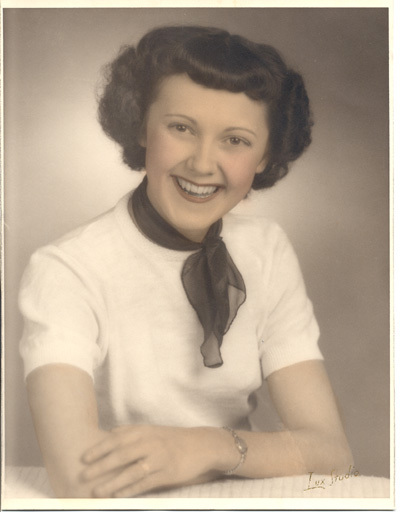 Mom was a proud graduate of Hallahan High School (class of ’51). She loved Christmas shopping and would begin in July and be finished before November. She enjoyed watching television and her favorite shows were the Sopranos, Law and Order, Price is Right, ER, Magnum PI and All in the Family. One of her favorite movies was “Titanic” and she would watch the DVD every few months. Mom was a fighter, not necessarily aggressive, but she’s had to survive some pretty challenging experiences: her first husband’s (my father’s) emotional breakdown; kidney failure when she was 33 which led to the removal of one of her kidneys and caused her to drop to 80 lbs (at five foot six, made her a walking skeleton); becoming a widow at 44; and, most recently, having to deal with COPD and emphysema over the last ten or so years. When she first became critically ill in 2004 and lapsed into unconsciousness, the doctors told us there was no hope for her, to take her off of life support. Instead, she eventually woke up. She finally came home after eight months of hospitalization to the new normal: oxygen machine, nebulizer treatments, myriad pills and medications. Although it was an uphill battle, she has always had a strong will to live. Whenever any of us helped to take care of her, she always thanked us profusely, whether it was for emptying her commode chair, making her breakfast or dinner or a snack of a soft pretzel or an ice cream cone. She often apologized for being a burden. I told her that it was a joy to help take care of her, to give back to her just a small portion of what she had given to me, and I know my stepfather and my siblings all felt the same. Mom, we miss you. Requiescat in pace. Happy Mother’s Day in heaven. 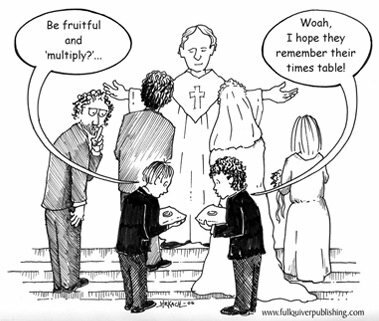 Please join me and other Catholic bloggers at This Ain’t the Lyseum for Seven Quick Takes Friday. I have always enjoyed the month of May. It happens to include some family birthdays, a holiday, my wedding anniversary and, of course, May is the month of Mary. 1. May is Mary’s month. When I was a child in Catholic school, each May the entire school and parish took part in the May procession. One 8th grade female student was chosen as May Queen to crown the statue of Mary. When my mother was 13, she was chosen to be May Queen at St. Richard’s School in Philadelphia. Years later, when we were living in Philadelphia and attending the same parish and school, my sister was also chosen to be May Queen in 1971. The photo below is of my mother as May Queen (1947). 2. May is usually a great weather month. After the long winter we had, I look forward to May’s spring weather. 3. May is a month of birthdays. 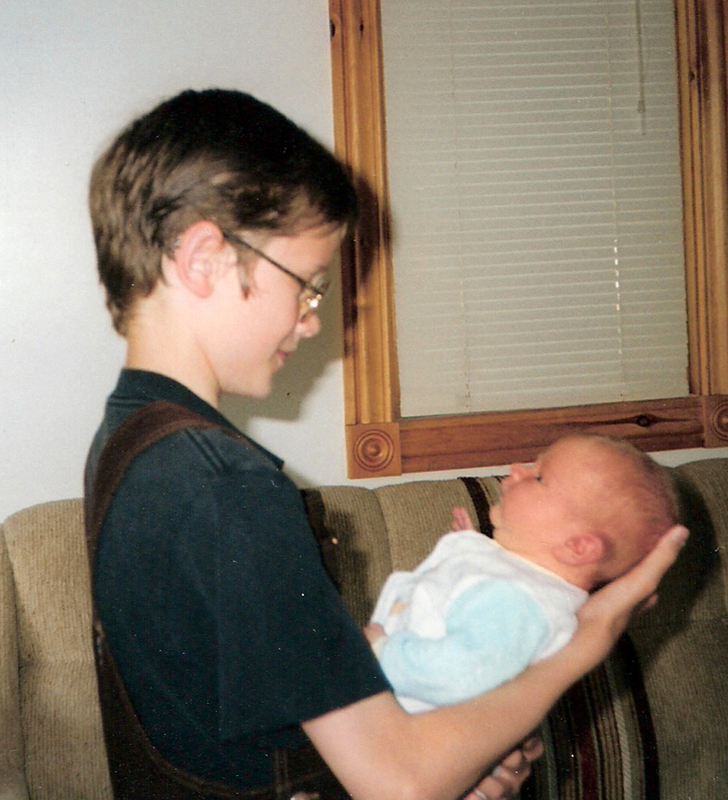 I’ve shared before that my youngest son was my favorite birthday present 16 years ago. 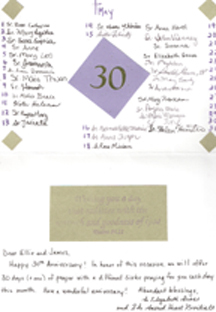 Besides my son’s birthday and my birthday, there are numerous other relatives who have birthdays in May. 5. May is the month of Mother’s Day. I have always tried to honor both my mother and mother-in-law. My mother has been gone for nearly eight years, but I still remember her daily in prayer. We usually treat my mother-in-law to dinner at a restaurant. As a mother myself, I have always enjoyed receiving home-made, creative gifts from my sons and have treasured these special mementos. The photo below is of me and my mother. 6. May includes a three-day weekend. Up here in Canada, the third Monday is Victoria Day, which is a holiday similar to Memorial Day in the USA. We usually celebrate by barbequing and enjoying a day off. It’s the unofficial start to summer (I say unofficial because up here in Canada, anything is possible in terms of weather…I have seen snow flurries on one or two previous Victoria Day holidays).